Mi5, as the launch of the device (24 Feb 2016) is coming closer here are few things you need to know. This image below includes some unrevealed specs what do you see comment below. One of the known specs so far about the Mi5 is one of the powerful processor is Snapdragon 820 processor. As being a flagship device we could also make of some specs like 4G LTE support, fingerprint sensor, bigger battery and good display. From the Xiaomi Mi 5 screenshot we could make out that the device will have NFC inbuilt, CDMA 1x support besides GSM and 4G and the post also states "First Screenshot" so there might be more in near future. The Chinese tech giant smartphone might be running Android Marshmallow out of the box, this is an assumption and hope that it happens. 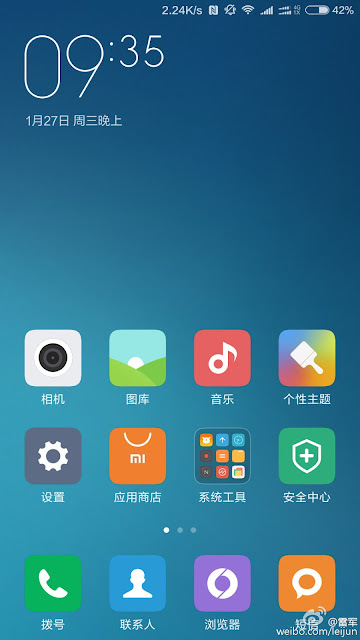 It seems like Xiaomi making big promises and might even win the hearts of the Xiaomi fans. Could someone translate the chinese labels to english? The Redmi Note 4 has an excellent spec for a phone of its price and screen size. It is equipped with Qualcomm Snapdragon 625 processor and 4GB of RAM, the device was able to handle most of the task and games with a breeze. Daily tasks never show any hiccups, including multitasking.